“Wike blaming the Police and INEC for PDP’s current misfortune in Rivers State and loss of most of her National and State Assembly members in the Appeal Court as not only unfortunate but a calculated attempt to excuse himself as the main culprit for PDP’s misfortune in the State. The Party also described Wike’s excuse for his failure to develop the State as unfortunate, sad and unacceptable because many other states have been recording great achievements despite also experiencing economic recession. A few examples would suffice: Governor Atiku Baguda of Kebbi has achieved stable power supply in 16 LGAs and also established the Rice Pyramid (Lake Rice) in partnership with Lagos. Governor Akinwunmi Ambode of Lagos s set to launch 5,000 new buses in Lagos, in addition to numerous other feats. “On his part, Governor Ben Ayade of Cross River can boast of setting up the biggest Garment Factory in Africa, the Rice City Project and Calabar Monorail, while Governor Udom Emmanuel of Akwa Ibom has set up the First Pencil Factory in Nigeria, Led Factory and Automobile Assembly Plant. In 2015, The kebbi state government secured a loan from the CBN for rice production. Today, kebbi has the biggest rice mill in Africa but sadly the over 130 Billion Naira so far borrowed by Wike was wasted on sponsoring his cronies and cohorts to watch European matches and sponsoring the unfruitful activities of PDP instead of developing the State. Still in 2015, the Taraba State Government partnered with CBN to secure a loan of N2 billion for the first greenhouse project in the entire north east sub region. Today, Taraba has a brand new green house farm and the largest in Nigeria. The project was initiated with an initial capacity to produce four exotic crops- cucumber, lettuce, pepper and tomatoes but on Wike’s side, what did he achieve but to destroy all the agricultural initiatives of the Amaechi’s administration. “The whole world can now better understand why Wike has turned the Garden City into the Garbage City. We can now understand why Wike has turned our once peaceful State to Rivers of Blood where killing and beheading of innocent people is now the order of the day. “We can now understand why Wike decided to use our funds to fund his dying party, PDP, instead of paying the salaries of our civil servants and pensioners. We can now understand why Wike has decided to destroy our educational system that Amaechi put on a sound footing. Wike has stopped the scholarship scheme initiated by Amaechi to ensure that no Rivers child is left uneducated. He has stopped the use of over 350 model schools constructed by Amaechi’s Administration so that he can embark upon the construction of his 175 non-existent schools to enable him siphon public funds. “Because of Wike has nothing to offer, he has destroyed the Banana Plantation, The Buguma Fish Industry, the Songhai Agriculture revolution and other industries set up by Amaechi to generate funds for the State and provide employment for our teeming undergraduates. The party also described the recent statement credited to Dr. Abiye Sekibo a PDP chieftain and one time Minister of Transportation reassuring Wike while lamenting the removal of Senator George Sekibo from the Senate by the Appeal Court that, “We know that 2019, war is coming. 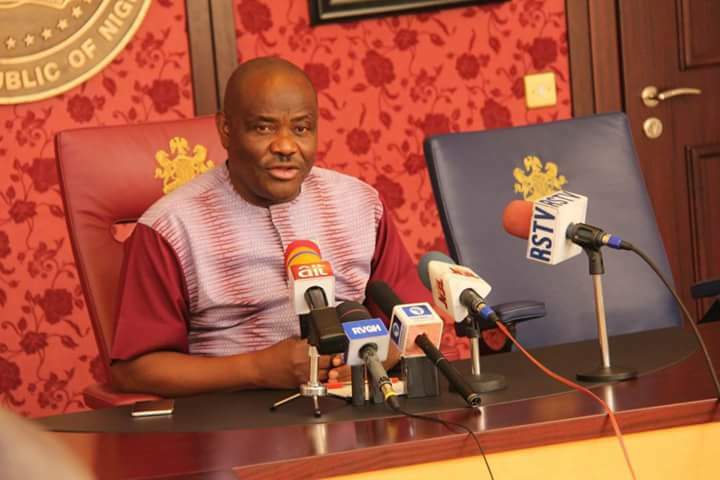 But we the leaders of the War Canoe Houses of Okrika assure you that we are ready for it and will stand by you to defend Rivers State,” To us as a peaceful political party, we understand this unfortunate statement as another call to re-enact the bloody step that PDP took in 2015 to kill hundreds of Rivers State people in order to install Wike as the Governor of Rivers State. This threat notwithstanding, we will like to assure Wike, Sekibo and his war lords that the sad incident of 2015 will not be allowed to repeat itself come 2019. We will have peaceful election where Wike for the future and greatness of Rivers State will be voted out massively if he will have the courage to contest.